Summary: East Sussex, 1914. It is the end of England’s brief Edwardian summer, and everyone agrees that the weather has never been so beautiful. Hugh Grange, down from his medical studies, is visiting his Aunt Agatha, who lives with her husband in the small, idyllic coastal town of Rye. Agatha’s husband works in the Foreign Office, and she is certain he will ensure that the recent saber rattling over the Balkans won’t come to anything. And Agatha has more immediate concerns; she has just risked her carefully built reputation by pushing for the appointment of a woman to replace the Latin master. But just as Beatrice comes alive to the beauty of the Sussex landscape and the colorful characters who populate Rye, the perfect summer is about to end. For despite Agatha’s reassurances, the unimaginable is coming. Soon the limits of progress, and the old ways, will be tested as this small Sussex town and its inhabitants go to war [x]. Review: I requested to read this book on NetGalley and was thrilled when Random House accepted. 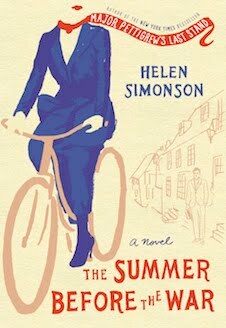 This novel takes places as the title states the “summer before the war” in 1914 in a town called Rye. It begins with Beatrice Nash moving into the town alone to become the schools new Latin teacher. She appears to be the “main character” with the other characters interacting with her. It’s interesting to see how times were back them. The way society went about in that time. Simply gossiping and the “upper class” over indulging slightly. If you weren’t married or marriageable then you meant nothing to the ladies of Rye. Slowly the War began to weave itself in the story and slowly the actions of the town started to change. Simonson was able to capture the dialogue and describe the scenery fantastically. My only wish is that there was a little less about the summer and a little more about the war. The part with the war seemed a little rushed to me and I wish it went on a little longer. I read a review on this book and someone described this book as a “creeper” and I totally get it. This book is a slow-paced read but once you hit a certain point everything starts to happen and a few plot twists are thrown in there. I was also thankful that the romance in this novel was slow-paced. Novels tend to use insta-love and this romance felt real. I would definitely give a book by Helen Simonson a go in the future. Most likely, Major Pettigrew’s Last Stand. If I see this book at my local bookstore I will pick it up to add to my book collection. I recommend this novel to anyone who adores historical fiction. This entry was posted in ARC, book, book review, book reviews, books, historical fiction, netgalley, review, reviews, The summer before the war. Bookmark the permalink.